London Hotel in London - Windsor House Hotel in London: Central London Bed&Breakfast Hotel. 2 Diamond category. Super-clean, Super-comfortable and Super-affordable. Singles, doubles, families with children welcome in 3/4/5 bedded family rooms. Central London Bed&Breakfast Hotel. 2 Diamond category. Super-clean, Super-comfortable and Super-affordable. Singles, doubles, families with children welcome in 3/4/5 bedded family rooms. Free use of our hotel kitchen for preparing own lunches/teas/dinners. Sunny, safe garden patio. 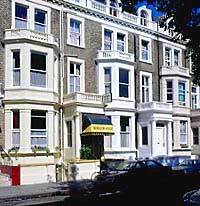 All you need for a comfortable, friendly and inexpensive stay in London. Feel at home away from Home. The Windsor House Hotel looks forward to welcoming you soon!